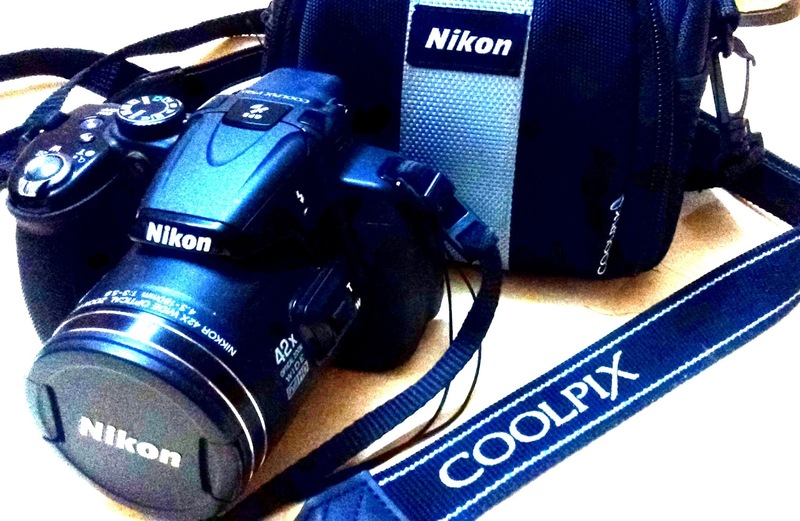 I have been doing photography as a hobbyist since some time now - started with the Nikon P520 & have been continuing so. 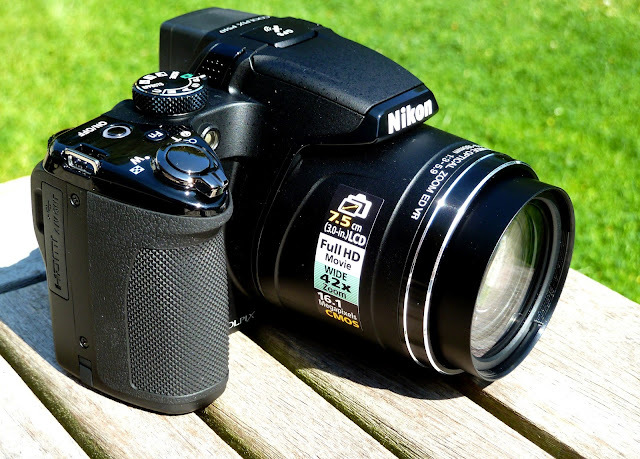 The Nikon P510 is the immediate predecessor to the P520 and is very similar to it except for 16mp sensor and a tilting screen instead of fully articulating and a few other changes. About the superzoom: The P520 is a zoom camera with a 42x optical zoom with 18MP 1/2.3” sensor (that’s very small) & no RAW support. 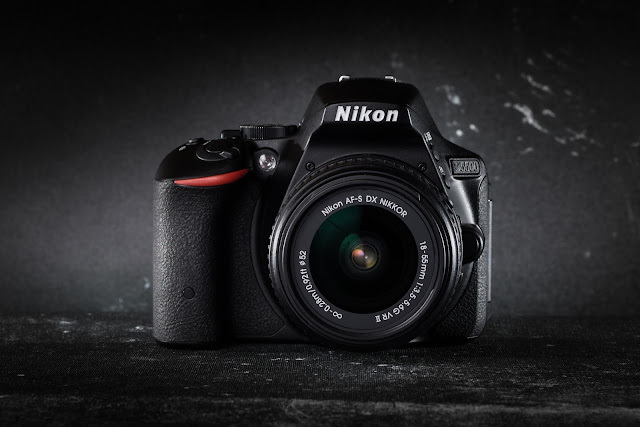 Nikon has always shied away from giving RAW in its superzooms (a RAW file stores the full data captured by the image sensor retaining the original image detail giving a much higher scope for editing and post processing an image; it's the digital equivalent of film negative. A JPEG is a lossy compressed and processed image which is optimized for consuming less storage space but at the cost of detail and quality). I must admit that at start I was pretty much content with the pictures the camera was delivering (didn’t go into post processing, pixel peeping or anything serious). But as I started getting more engaged into this hobby of mine, the whole photography experience started getting more and more unsatisfying – the pictures now started looking pale and noisy, lacking detail; camera controls felt limited (even when this one has 2 command dials), focus felt slow, unsharp images from lens etc. I started messing a lot with the settings but soon realized I had to be very careful when changing the ISO, the variable aperture had adverse effects when zooming & overall found there was very less scope for me to change settings without worsening quality. I was missing RAW, the controls were very restricted & I didn’t want to go into menus & sub-menus every time to change essential settings. The reason for the lack of quality was the small sensor on a typical superzoom. While still having such small surface areas, it’s divided into 18 million parts! - End result of this is, having very less light incident on each of those parts resulting in high noise and low dynamic range. A lower dynamic range results in a lower capacity for accommodating high contrast scenes like landscapes which have both dark and bright areas, resulting in either the brighter backgrounds getting blown up to full white (aka clipping) or darker areas being too dark. They also result in dull & washed out colors. Things get even worse at night and indoors - there are focusing issues, especially at the longer end of the zoom range, and even then it took an awful lot of hunting to get anything in focus. 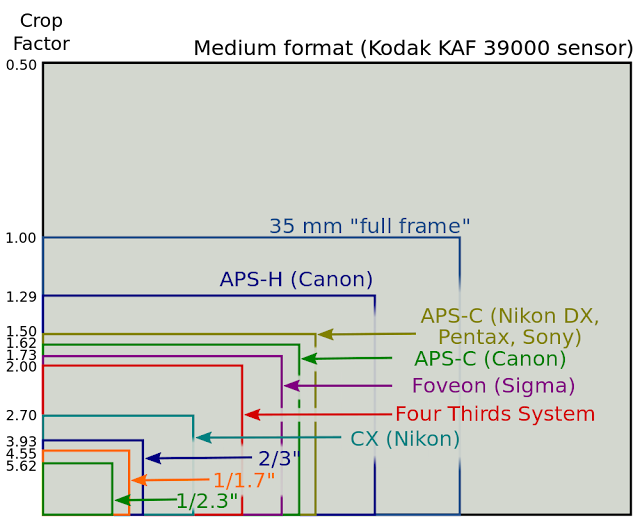 To get an idea as to how small a typical superzoom sensor is, see this illustration comparing various sensor sizes. Crop sensor bodies (i.e. 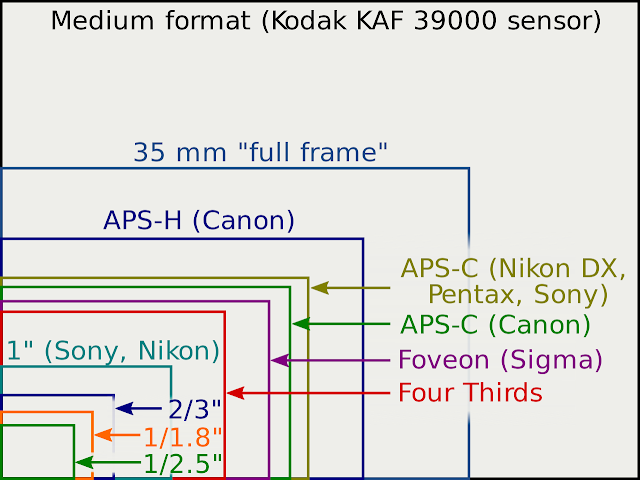 bodies having sensor size smaller than 35mm full frame by a factor of 1.6 times for Canon (APS-C) and 1.5 for others) as the name suggests have a smaller sensor which translates into a field of view equivalent to the focal length multiplied by the crop factor, i.e. you by default get a 1.5 or 1.6 times "zoom" with a lens at same focal length. This is an advantage while shooting wildlife where at the long end you get that extra reach, plus overall due to a smaller sensor, the camera body is smaller too and so are the lenses, thus making your photography carry bag lighter. At the same time the sensor in these cameras isn't small enough to hugely affect image quality. This gives you a good balance between mobility and image quality. Field of view, full frame vs. crop at 35mm. Notice how the "field of view" gets narrowed with the use of cropped sensors. To get the equivalent field of view of crop sensor DX using a full frame camera, you will need to zoom in 1.5 times, i.e. ~52mm. Hence the term 1.5x crop for crop sensor DSLRs. Also the term equivalence comes in picture since the same 35mm lens when used on a 1.5x crop sensor, will result in a field of view "equivalent" to that created by a 52mm lens on a full frame camera. For four thirds, it's an even higher 2x crop as compared to full frame. Due to the inherent bump in field of view, things may get a bit too narrow at the wide end. To compensate for this, lens manufacturers usually have their walkaround lenses start at a much wider angle of view of 18, 17 or 16mm. Also ultra wide angle lenses start much wider from say 10 or 12mm. Superzooms i.e. cameras having very high zoom range aren’t the only zoom cameras out there. There are bridge cameras (bridges sit between casual point & shoot & serious interchangeable lens cameras). You have the Panasonic FZ1000/2000/2500, Sony RX10 series & Canon G3X who have 1 inch sensor (larger and better than 1/2.3”) all ranging from 8.3x to 25x zoom. The reason why these cameras can afford to have a versatile fixed zoom is because of the use of 1" sensor which is small enough to allow camera makers use a high versatile, all in one zoom, ranging from ultra wide angle to high telephoto zoom, while still keeping a respectably wide aperture as compared to superzooms. 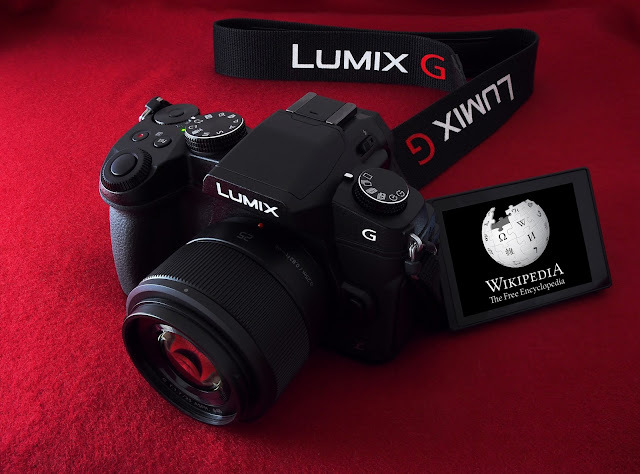 The Panasonic Lumix FZ 1000. This is a bridge camera with a 1 inch 20MP BSI cmos sensor, an all-in-one 16x 25mm-400mm f/2.8-f/4.0 zoom lens. It also supports 4K at 30fps. Such bridge cameras work as excellent all in one photography solution without the hassle of changing lenses thanks to a wide range and a relatively fast maximum aperture. Also the 1 inch sensor performs much better than the 1/2.3" as far as high ISO noise, dynamic range and out of focus background is concerned. The Panasonic FZ 1000 and FZ2000 are considered as very capable video cameras thanks to their good video shooting capabilities. These cameras sacrifice on telephoto reach, but use a much brighter zoom lens, have lots of dedicated buttons (often more than DSLRs) and are better suited for action, sports and low light photography than a superzoom thanks to a much larger sensor which gathers more light and an equally capable and fast lens system, both in terms of focusing speed (coupled with a sophisticated focusing system in the main body) and exposure. They also make highly capable video cameras, many providing 4K video capture capabilities and professional tools like LOG profile. Other than these bridge cameras, there are also cameras with 1 inch sensor, but which sacrifice zoom for ultimate portability. These, often are designed to be small enough to fit in your pocket and have a zoom range anywhere from 3x to 10x. Here a lower zoom gives scope for a wider aperture, so the low 3x zooms commonly have a maximum aperture range of f/1.4 or f/1.8 to f/2.8. On the other hand the higher zoom cameras start where the low zooms end, with maximum apertures ranging from f/2.8 to f/5.6 across the zoom range. 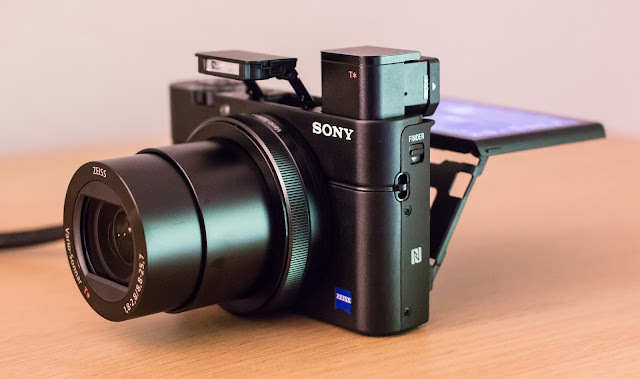 This is a compact mirrorless camera using a 1" sensor just like the FZ1000 above but sacrifices zoom range (3x zoom) for a brighter maximum aperture (f/1.8 - f/2.8) and a very compact body. Examples among fast low zoom lens include the Panasonic Lumix LX15 having a 3x 24-72 f/1.4-2.8 lens, Sony Cyber-shot RX100 with V 24-70mm f/1.8-2.8 lens, Canon PowerShot G7 X II with 24-100mm f/1.8-2.8 lens. 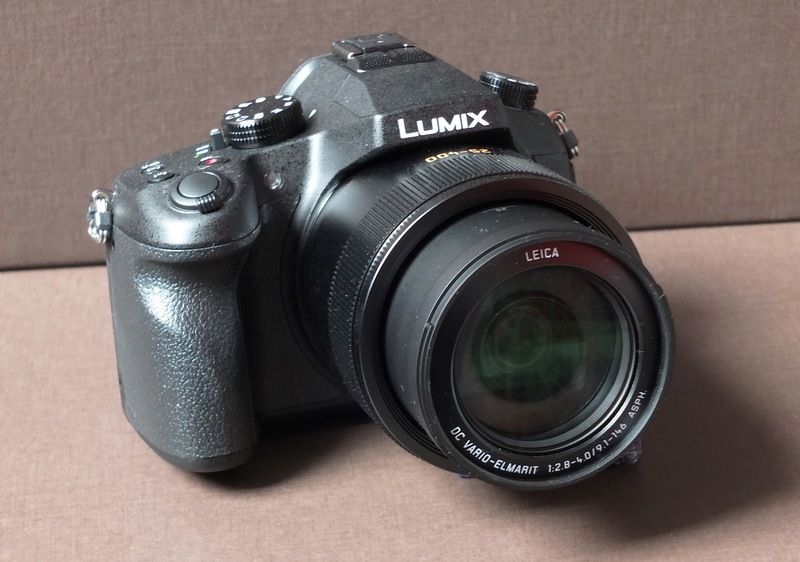 Among the slow high zoom, there's the Panasonic Lumix TZ100 with a 10x 25-250mm f/2.8-5.9 lens. Look at this picture to get a sense of how big or small the 1" sensor typically found in bridge cameras is in comparison to 1/2.3" sensors, APS-C & 35mm sensors found typically in DSLRs. Micro Four Thirds (MFT) is a system developed by Olympus and Panasonic in 2008. The sensor size of a MFT falls between that of a 1 inch sensor and APS-C, and compared to a full frame, has a crop factor of 2x, so while a 35mm lens will result in around an equivalent field of view of 50mm on an APS-C, it will be 70mm for MFT. Hence, to have a wide and ultra wide field of view, focal lengths starting in single digit range are common. Another point to note is that the sensor doesn't follow the standard 3:2 aspect ratio; instead it has a 4:3 aspect ratio - hence the name "Four Thirds". What this means is, as shown in the above illustration, the sensor is slightly narrow as far as breadth is concerned making it a bit more squarish than widish. The Panasonic G80 with the 25mm lens. Lens Intercompatibility - You can use Olympus MFT lenses on Panasonic MFT bodies and vice versa. This is because Olympus & Panasonic jointly developed the MFT format. 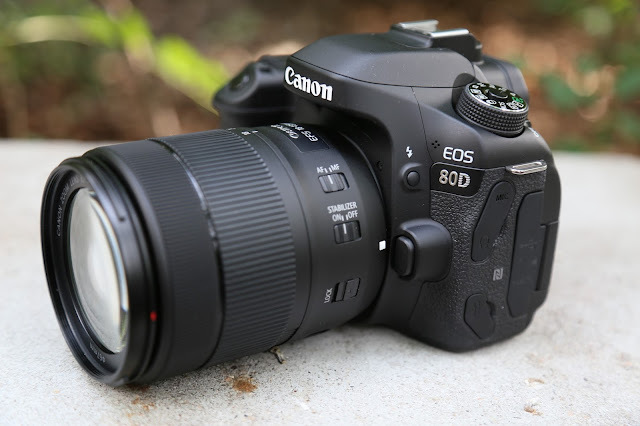 This capability is very significant since this gives you more choice of lenses and doesn't bind your choice of lenses with the choice of MFT body. So if you find Panasonic lenses preferable but want an Olympus body, you can do so. Same cannot be said about DSLRs. It's a mess of adapters, compatibility issues, reduction in functionality and performance degradation when doing the same in the DSLR world. You cannot expect any ease of use and hassle free user experience if you want to have, say, a Nikon lens mounted on a Canon. Even DSLR Lenses adapted to mirrorless APS-C and full frame bodies have shown performance issues. 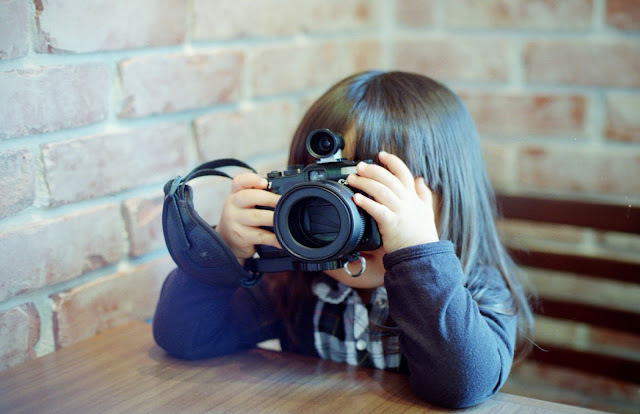 Interchangeable Lenses - MFT like DSLRs, use an interchangeable lens system. This makes more sense as they have a larger sensor compared to 1" sensor cameras (although there are examples of fixed lens MFTs). Due to this, they can provide flexibility of choosing the correct glass for the situation, and the choice of having image quality or convenience and not be limited by the available fixed lens. Use a prime for prime image quality and sharpness, zoom for convenience, a dedicated macro or a long telephoto for tracking wildlife. Versus superzooms & 1" sensors - A larger sensor obviously means superior image quality, noise performance and dynamic range than superzooms and bridge cameras. 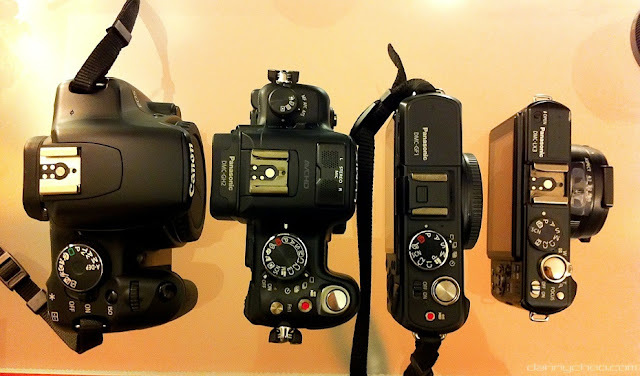 Versus DSLRs - On the other hand, since an MFT sensor is significantly smaller than APS-C/full frame, it has a smaller body along with a visibly smaller lens system. Micro Four Thirds are basically mirrorless cameras, so there is no need to accommodate that mirror assembly and pentaprism, making them even more compact. 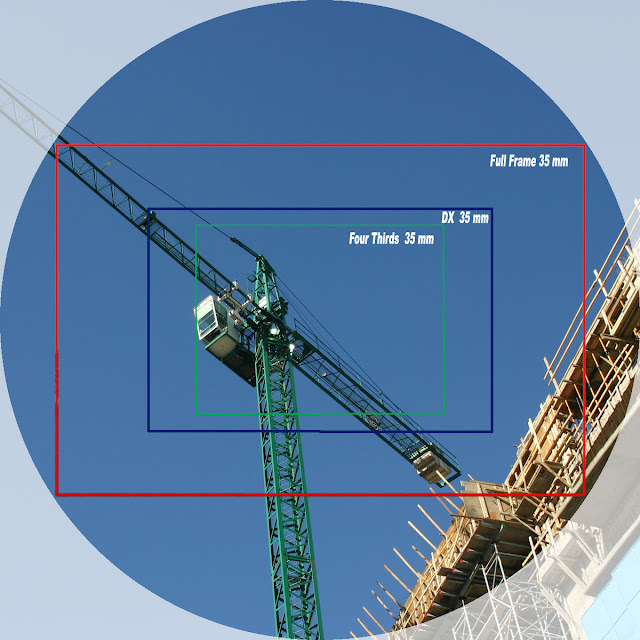 This balance between size and image quality is the main reason why many users including professionals are attracted towards MFTs. 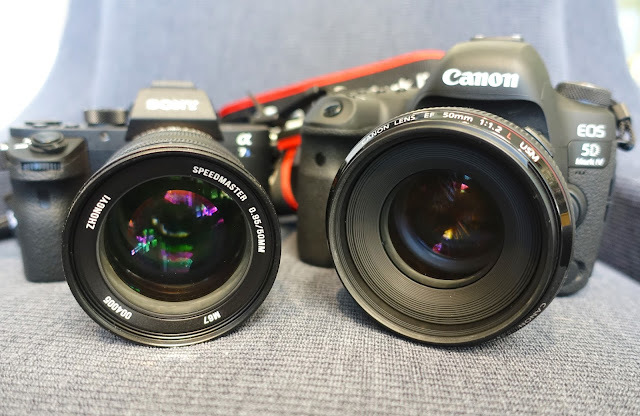 The Full frame Canon 5D mk III DSLR vs. MFT Panasonic GH4 baggage with equivalent lenses for walkaround (mounted), ultra wide angle and telephoto. 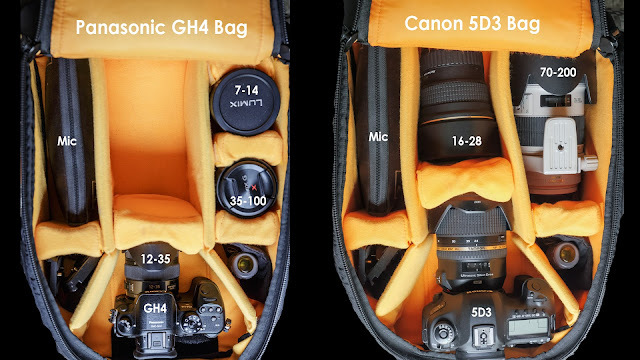 The GH4 and its lenses are much smaller and lighter, and will spare you from a back pain while keeping lots of space in your bag. Lens size and weight - As I have mentioned, lenses for MFT cameras are also very compact, complementing the smaller body. This smaller package means you have to carry less weight which is always welcome when you're travelling (your back will thank you). 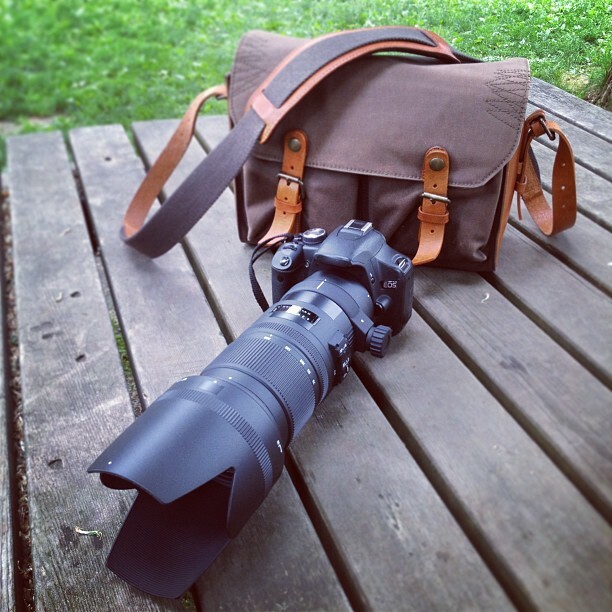 The MFT system is also compact which means you don't have to carry a large backpack. Some lenses could even fit in your pocket! This is also an advantage when you want to keep yourself discrete with a low profile, like when you're shooting people without them noticing - useful in street photography; or when you're trying to be sneaky and shoot in places where you're not supposed to, like museums. 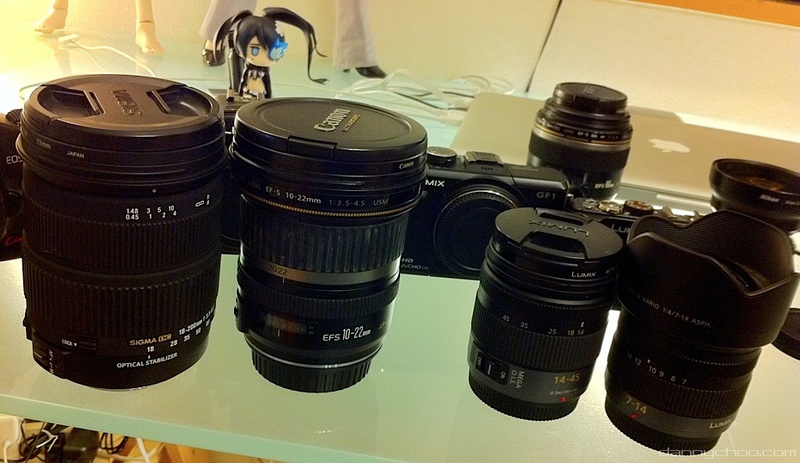 The full frame "Holy Trinity" - Tokina 16-28mm f/2.8 + Tamron 24-70mm f/2.8 + Canon 70-200 f/2.8 compared with their Micro Four Thirds counterparts - the Lumix 7-14mm + 12-35mm + 35-100mm. The Full Frame lenses are roughly three to four times heavier than those for MFT. The total MFT lens weight is 965 grams, just under a kilo, that's the weight of just the ultra-wide angle full frame, while the full frame combined lens will be around 3.25 k.g.s - clearly more than 3 times the MFT. And we haven't even included the weight of a full frame body which is generally double or more than that of MFT. Video Features - MFT cameras excel in certain fields where DSLRs lag behind, like in video features. The Panasonic GH4 is considered as a very serious and formidable video camera and is very popular among video makers due to its 4K support, touch feature, electronic viewfinder and excellent in camera tools for video shooting. EVF vs. OVF - Micro 4/3rds are basically mirrorless and have an electronic viewfinder instead of an optical. This means they enjoy all the benefits of an EVF like full information display, histogram and brightness adjustment. You basically are seeing what the sensor will be collecting, so it's easy to adjust exposure and avoid clipping (overexposing bright areas to pure white with no color information) which is difficult to achieve in an optical system. APS-C all in one zoom and ultra wide angle zoom lens compared to the Panasonic MFT standard zoom and ultra wide angle zoom lens. The size advantage of MFT is quite obvious. This helps when you're travelling with your camera and a big lot of lenses. Still the DSLR being a 1.5x crop, differences aren't as profound as full frame. Video & EVF - An EVF is also very useful in movie recording since you can use the eyepiece in bright sunlight where the live view display becomes difficult to read. OVFs in DSLRs don't enjoy such benefits. Live view - MFTs also provide some of the best live view functionality as compared to most DSLRs including features like zebras, focus peaking, live histogram, pre-burst shoot (Panasonic) and pro capture (Olympus), focus bracketing, post-focus (Panasonic, similar to focus stacking) and focus stacking (Olympus) etc. 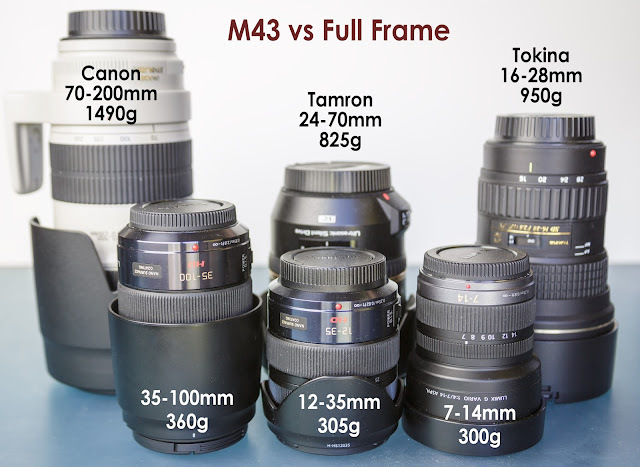 Micro Four Third GH4's 2x crop vs Canon 5D Mk III at equivalent focal lengths. 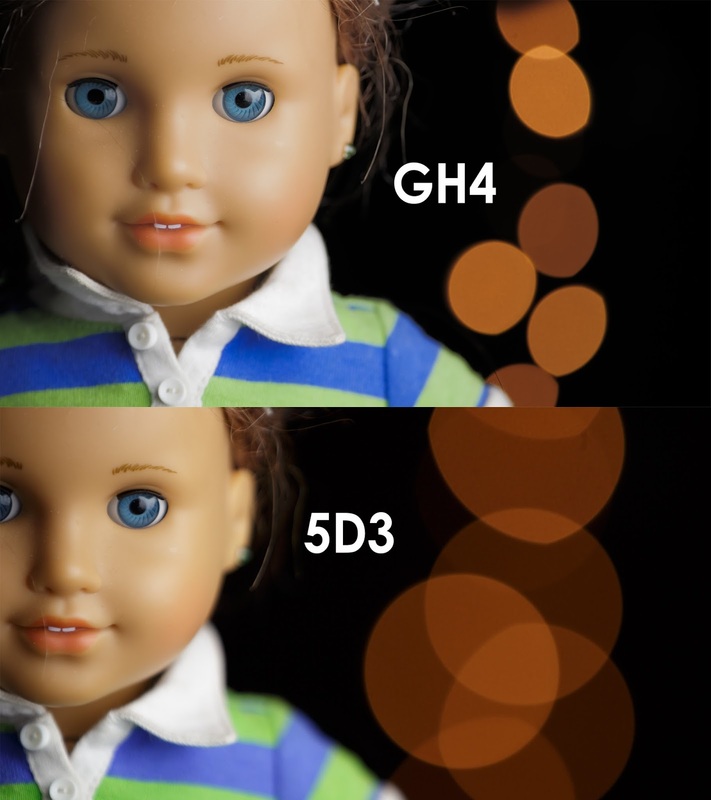 The GH4's 2x crop sensor is not able to get the same shallow depth of field which a full frame can do easily. To get an equivalent depth of field on an MFT, you will need a lens 2 stops brighter than that of full frame. 2x crop - A Micro Four Thirds with its 2x crop, will never be able to provide the same shallow depth of field for a given aperture what an APS-C or full frame will give you. To get an equivalent depth of field of a full frame on an MFT, you will need to use a 2 stops brighter lens, e.g. to get an equivalent depth of field of f/2.8 lens on a full frame, you'll need an f/1.4 lens on an MFT camera. ISO performance - Also MFTs don't perform very well at higher ISOs as compared to APS-C or full frame. Talking of noise, a smaller sensor means you can have lesser megapixels without adversely affecting ISO and noise performance. 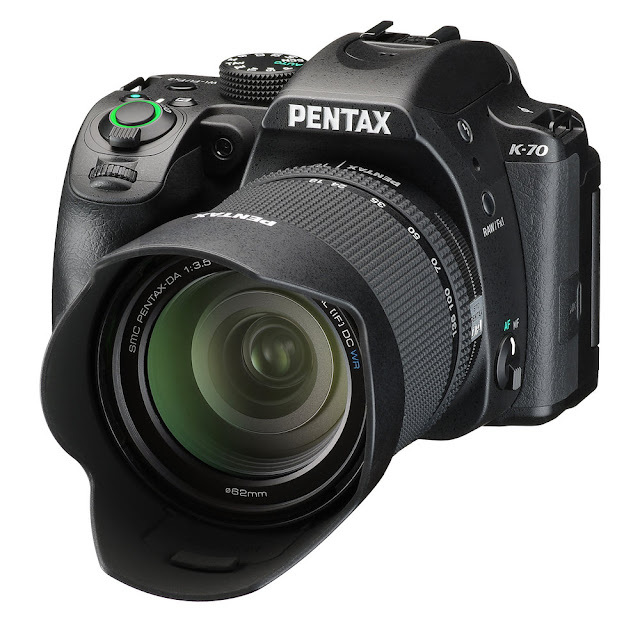 Hence MFT sensors commonly have 20-50% lesser megapixels than APS-C (12-20MP vs. 20-24MP). Aspect ratio - As mentioned above, the 4:3 aspect ratio is a bit odd. With this your landscape photos will need an even wider lens as compared to APS-C or full frame to fit in the whole scene. Also it won't match with the aspect ratio of your monitor which is also wide angle. But this is said to be an advantage in printing since a squarish ratio is more preferred. 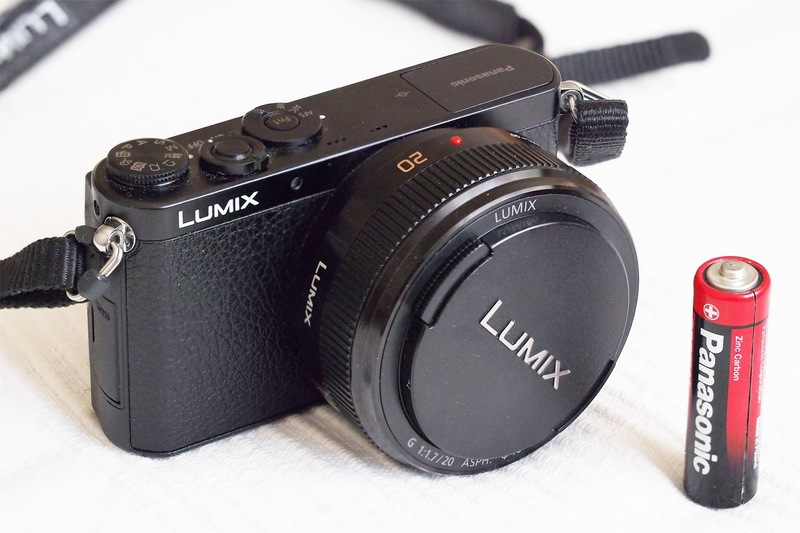 The Panasonic Lumix GM1 makes for a tiny camera as an MFT along with a small 20mm f/1.7 lens. 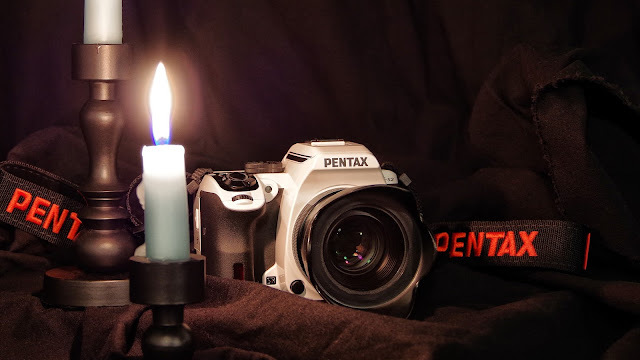 Such a setup is a great way to start your photography. A light body like a point 7 shoot, interchangeably lens system and enough scope for going advanced. MFTs make a great starter camera. 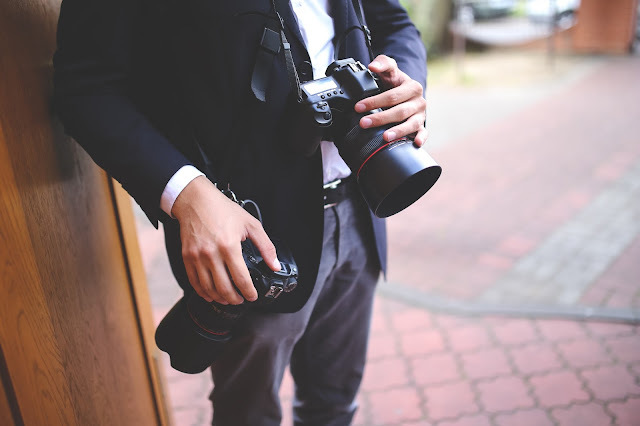 They are sophisticated enough to allow a lot of advanced photography with a level of image quality without the baggage of a large body and lenses. MFTs make as a great backup camera too, especially the lower end ones. One can have the large sensor but heavy, bulky full frame/APS-C as primary camera and the compact MFT as backup. So you can skip you DSLR for the MFT at times when the situation doesn't demand one. Most of you might know what a DSLR is. But for those who don't and want to know how and why it's different from a superzoom or any other mirrorless camera of any sensor size; to start, it's a camera generally distinguished by a much larger sensor than one found in a superzoom (APS-C to full frame or larger). It has an interchangeable lens system, meaning it has a separate body without any lenses fixed on it. Although this is not a requirement for a camera system to be termed as a DSLR; because they always use larger sensors, an interchangeable lens system makes sense for them than a fixed lens system. 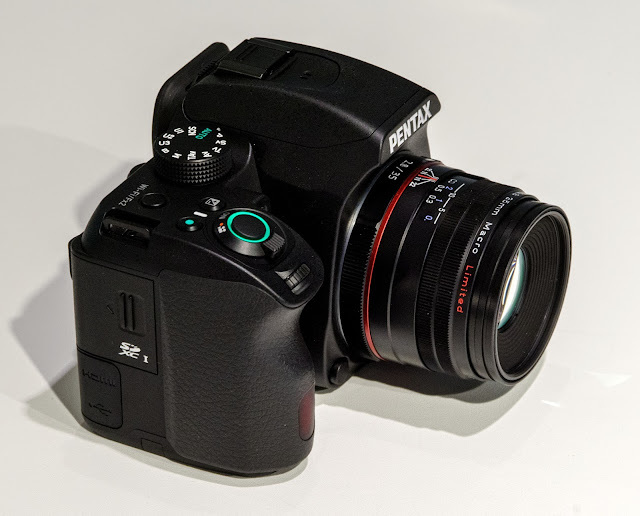 Due to this large sensor, these cameras are preferred by photographers who are conscious about image quality and demand better from their system in this department. Unlike mirrorless, these have a mirror which reflects light directly passed through the lens without any electronic delay. Hence it's still the favorite among sports and wildlife shooters. The camera is Nikon D3 with the Nikkor 50mm f/1.4 lens, shooting at 1/4000 at f/16. The main mirror first flips up, you can also see the secondary mirror behind it following the same. At the same time the aperture is set to the required setting (here f/16). After mirror is locked up the shutter is released. Note that the shutter consists of 2 curtains or doors. The first one is released then after a certain delay the second one follows. This delay allows a gap to exist between the two. Larger delay means larger gap, which means the sensor is exposed for longer period i.e. the shutter speed is low. The body has a sensor, eyepiece (viewfinder), back screen and a lens mounting system where we can mount many types of lenses (provided they are compatible). Then there is the mirror assembly used to reflect light coming in through the mounted lens to the viewfinder using a prism assembly. This mirror is actually semi-transparent and while it reflects most of the light to the prism, some of it is passed through. Behind this main mirror, is another secondary mirror on which this "passed" light is incident; it is then reflected to a phase detection system which is used for auto-focusing a lens. When we half press the shutter release button, this phase detect system instructs the lens AF motor to adjust (move in or out) the focusing lens. With the focus changed now, the phase detect system checks again. This system works in a loop till focus is confirmed by the phase detect system. 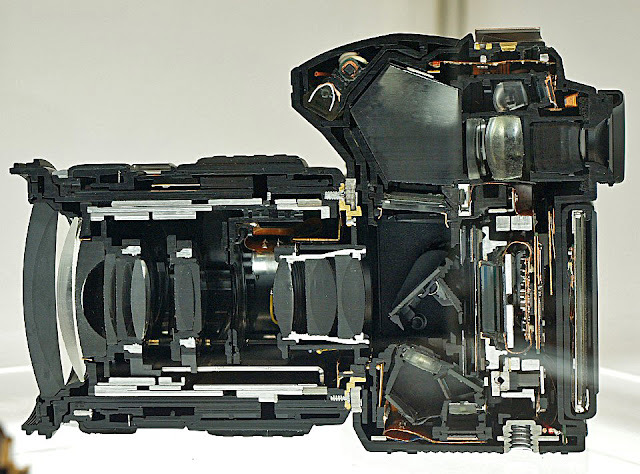 Cutaway of the Olympus E-30 DSLR with the lens attached. We can see the large pentagonal prism on top with the optical viewfinder on its right. Right below it we can see the mirror placed at an angle. Notice that just behind the mirror is another plane almost perpendicular to it. It's the secondary mirror used by the phase detect AF system that is placed just below it. Behind the mirror assembly is the shutter assembly and sensor. After attaining focus, the main and secondary mirror is flipped on top exposing the sensor for a timed exposure. Once the focus has been confirmed, we can then fully press the shutter release button to take the shot by exposing the sensor. When we do so, the main mirror is flipped up. While the mirror is out of the way, the digital sensor is subjected to a timed exposure (using a shutter mechanism to control the duration for which every individual pixel is exposed) to incoming light from the lens to create a photograph. This phase detection system is what makes a DSLR so different from other systems in behavior (you get to see real life view in the eyepiece), performance (there is no lag between real life action and what you see) and body size (the mirror and pentaprism makes the camera body bulky and heavy). This affects even the lenses, since they need to focus from a distance as compared to mirrorless lenses which are much closer to the sensor as they don't need to make space for a mirror. Flange Distance, or the distance between the front of mount and sensor plane on a DSLR is much greater than that of a mirrorless body thanks to the reflecting mirror resulting in a bulkier and heavier body. Also overall weight is increased due to the need of a prism or mirror for reflecting light towards the viewfinder. This is done in a mirrorless using an electronic display. The above SLR system is different from superzooms, MFT or any mirrorless where there is no mirror or prism, instead the sensor is continuously exposed to display the photographer what the sensor is seeing either at the viewfinder (which is basically a small screen) or the main screen at the back. Superzooms, as mentioned above have smaller sensors, which translates into a smaller lens system. Smaller lenses let in less light but can be made to have much larger zoom range (the Nikon P900 is a whopping 83x zoom). Now since you have a single lens covering a whole focal length range, it makes sense to have it built and fixed into the camera than have the hassle of changing lenses every now and then. Hence, the fixed lens system. In case of a DSLR, since we are dealing with a much larger sensor (APS-C or full frame), the lenses too become bigger (when compared to superzoom lens on 1/2.3" sensor) because now the lens has to maintain a larger image circle. Here having a high zoom is difficult, especially with larger aperture. So we have DSLR lenses with 3, 5, 7 or even as high as 15 or 18x zoom, although among higher zoom lenses we see decrease in image quality and amount of light let in (due to small apertures). But something of the magnitude of a superzoom (42x, 50x, 83x) covering a humongous range simply isn't practical. 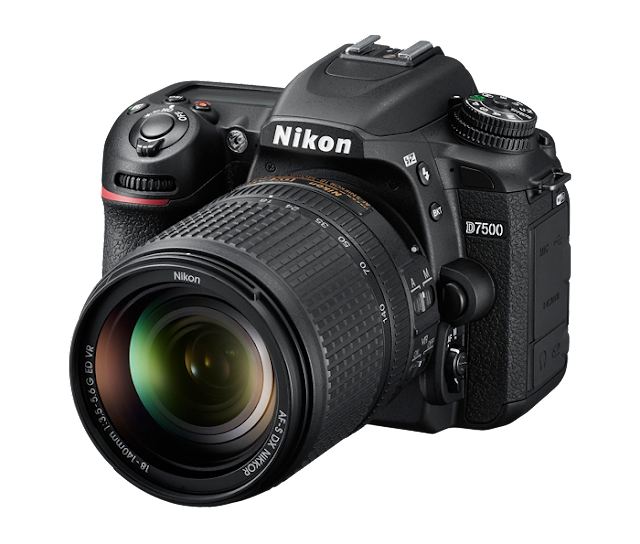 Interchangeable DSLR lenses which promise a respectable image quality usually cover a limited range of focal lengths e.g. (for APS-C) at wide end you may find lenses going from 12mm to 24mm, in the standard range you may be familiar with the 18-55, and then in telephoto range you may find something like a 55-300, 50-200 or 70-300. Other than zooms, you also have prime lenses, which have a fixed "zoom" i.e. a static focal length. These offer a very large aperture and let in more light, resulting in blurred out backgrounds useful in separating the foreground from the background. These provide very high image quality resulting in very sharp images. Off-course the tradeoff is that you lose the flexibility of a zoom and may need to move back & forth to get the correct composition. At first, when I had started as a newbie to photography with the P520, I was apprehensive of DSLRs due to their lack of high zoom lenses (I needed zoom since I like bird photography) & also due to high lens cost (especially as you go more into telephoto territory). But as mentioned above one must accept the practicalities involved here. There are huge limitations imposed on the lenses when you have a large sensor to serve, & any compromise in quality isn’t taken well by their target audience – most people buying a DSLR would expect a higher optical quality than a superzoom since they opted for large sensor mainly for better image quality at the first place and wouldn’t like it if the lens is a letdown. But with a large sensor & large lens there also comes huge artistic value – you can get a much shallower depth of field resulting in blurred backgrounds, better image quality from both the sensor and the lens. A photo with a blurred background makes the viewer focus on the intended subject and avoid background distractions. To get this blurred, out of focus background, a large camera sensor complemented with a lens with a larger maximum aperture (the opening of the lens towards the sensor) is needed. Here the DSLR comes into picture. The general image quality from both the sensor and the lens is miles ahead of superzooms. They give you the reach which a DSLR cannot, are much lighter & have much less hassle – no changing lens every now & then, no carrying bunch of lenses while travelling, overall making this a one stop shop: jack of all trades – master of, maybe only zoom & convenience. 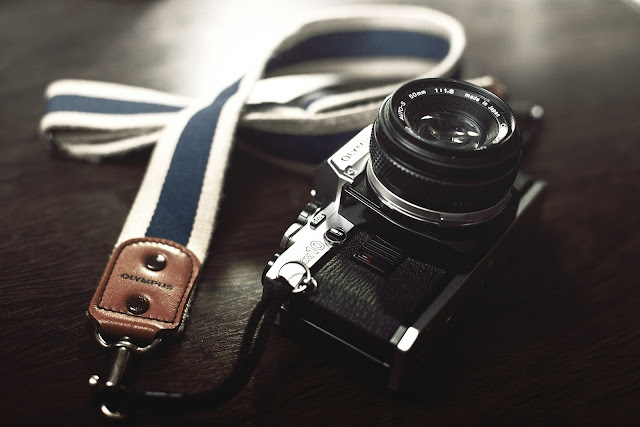 In this article we have seen that the all-important image sensor and its size determine how the camera will look, behave and perform which then dictates what type of photography it is best suited for. We discussed the pros and cons of smaller sensors and why they are designed that way. We also discussed the design and working of DSLRs and why its design is different from that of smaller sensor cameras. In the next article we will discuss about DSLRs and mirrorless using the larger APS-C sensor in more detail. In case you have any suggestion, advice or criticism, please feel free to post them in comments. Your comments are really valuable for me.